(22th Feb 2016) At a summit of 10 Asian nations in California, Vietnamese Prime Minister Nguyen Tan Dung urged Obama to have a “strong voice” and take “more practical actions” to end activities aimed at upsetting the “status quo’’ and, by implication, establishing Chinese hegemony, according to a Vietnamese government news Web site. Suggesting that stronger efforts may be coming to try to stop Chinese expansionism in the South China Sea, President Obama will visit Vietnam on the same trip that he makes to attend the G7 Summit in Japan in late May. Vietnam has signaled a shift to the West to try to block China’s increasingly aggressive strategy in the waters off Southeast Asia. The most recent example of Chinese aggressiveness in the South China Sea is China’s installation of surface-to-air missiles on Woody Island in the Paracels, off Vietnam, which claims the island. Many observers believe that the Chinese are trying to establish control over the shipping lanes in the region. 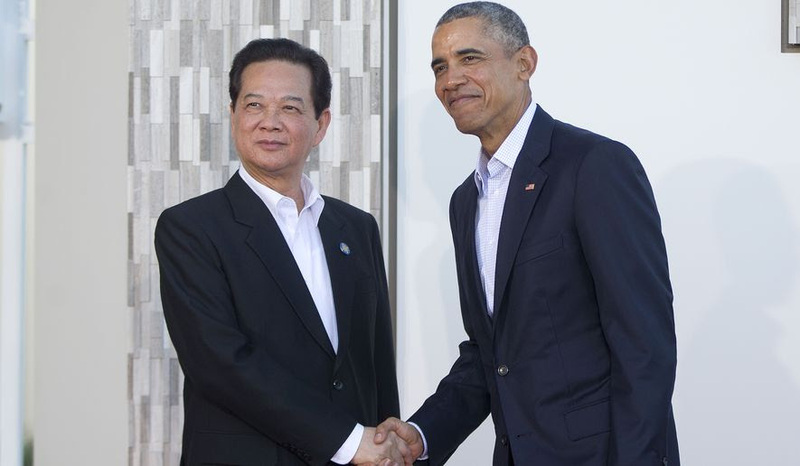 At a summit of 10 Asian nations in California, Vietnamese Prime Minister Nguyen Tan Dung urged Obama to have a “strong voice” and take “more practical actions” to end activities aimed at upsetting the “status quo’’ and, by implication, establishing Chinese hegemony, according to a Vietnamese government news Web site. Mr. Dung said the accelerating Chinese militarization of disputed islands and reefs in the South China Sea were a “real threat to peace, security, safety and freedom of navigation and aviation,” VGN News reported. Maritime security and the freedom of navigation in the sea were among the main topics of the summit in California. Vietnam is a member of the 12-nation Trans-Pacific Partnership, an expansive trade and regulatory pact that includes the United States, Japan, Mexico and Australia. Obama accepted the invitation by Vietnamese Prime Minister Dung during a meeting this week at a summit of Southeast Asian nations in California. “The president and Prime Minister Dung discussed the continued strengthening of U.S.-Vietnam relations in 2015, which marked the 20th anniversary of the restoration of diplomatic relations,” a Vietnamese government spokesman said.